Charango ideal for beginners, made of naranjillo wood. This type of wood is stable and resistant to climate changes providing the instrument with an excellent sound. 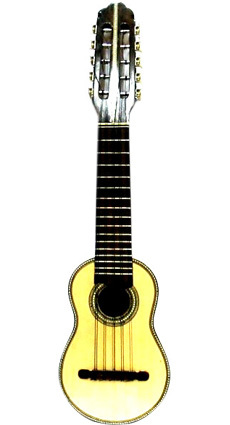 The charango comes in a classical and traditional model with impecable sound. Tuning: typically tuned GCEAE. all ten strings are tuned inside one octave. The five pairs of courses or strings are pitched as follows (from 5th to 1st course): gg cc eE aa ee.) It usually has 5 charango strings and 5 guitar strings. There are many stories of how the charango came to be made with it's distinctive diminutive Sound box of armadillo. One story says that the native musicians liked the sound the vihuela (an ancestor of the Classical Guitar) made, but lacked the technology to shape the wood in that manner. Another story says that the Spaniards prohibited natives from practicing their ancestral music, and that the charango was a (successful) attempt to make a lute that could be easily hidden under a garment. It is believed the charango originated in the 18th century Andes somewhere in modern-day Potosí, Bolivia, probably from Amerindian contact with Spanish settlers."